What can I Do with a Humanities Degree? Anything. On November 18, 2015, the Department of Humanities hosted its annual career day. Nine professionals—all with degrees in the humanities and alumni of York University—shared their stories from diverse and exciting industries including journalism, sales and advertising, business communication, law and social advocacy. Panelists agreed that the transferrable skills they developed as Humanities majors in critical thinking, writing and communication, and critical perspectives positioned them not only for transition into the workforce, but for success and leadership in the careers of their choice. 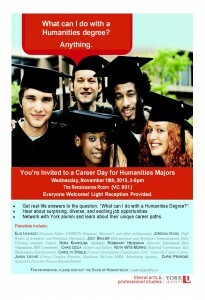 Visit the Career Centre website for additional career choices in Humanities.